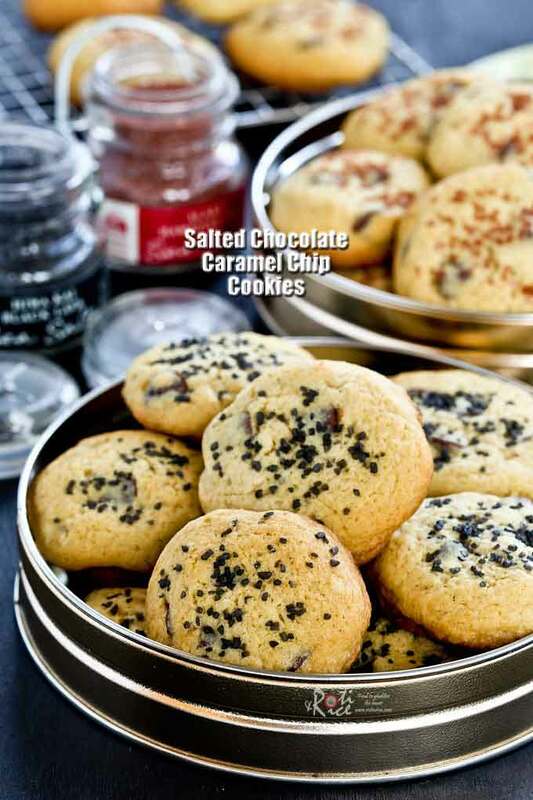 Naturally colored sea salt gives these Salted Chocolate Caramel Chip Cookies a sweet salty flavor. The combination of sugars provide the perfect texture. 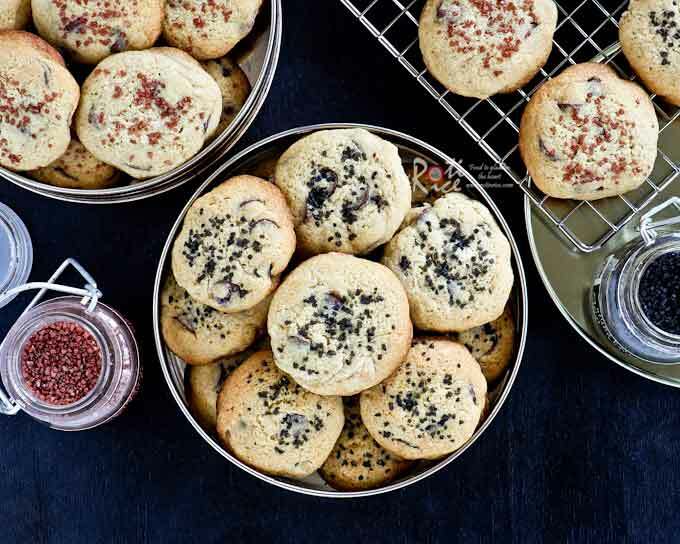 Cookies are some of the most fun and delicious treats to prepare during the holiday season. Some time back I bought some baking chips which I had forgotten about. With the holidays just around the corner, I went through my baking cabinet and found these milk chocolate morsels with caramel filling which are still in good shape. Salted Caramel is all the rage and so I figured it will be fun to make some Salted Chocolate Caramel Chip Cookies. I can’t resist buying sparkly sugar sprinkles and the same goes for naturally colored sea salt. It is something about those crystals that always catch my attention and so I picked out a jar each of the following. Pepper Creek Farms Sea Salt, Hiwa Kai Hawaiian Black Lava, 4.57 Ounce. I had no recipe in mind when I bought these two jars of salt but now I do. 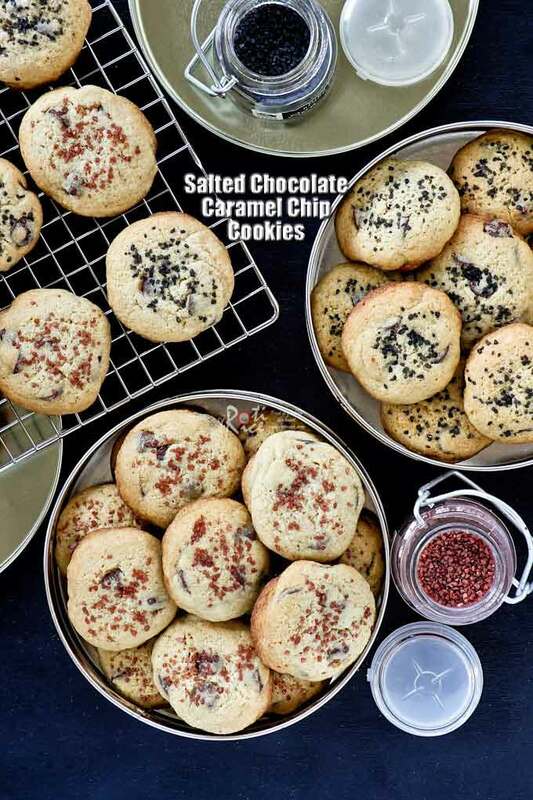 They are perfect as a sprinkle for these delicious sweet salty and slightly crunch Salted Chocolate Caramel Chip Cookies. I am especially pleased with the texture of these cookies. They have a slight crunchiness to them but not crisp like a cracker and they are certainly not too soft and chewy. As I have explained in my Chocolate Chip Cookies post, granulated sugar do produce crunchier cookies. Therefore, you can adjust the texture by using more or less granulated sugar as per your preference so long as the total amount of sugar used is 1 cup. If you prefer not to buy the Hawaiian sea salt, simply use some coarse Kosher salt. The latter may not be as fun but they should work. Line two baking trays with parchment paper. Preheat oven to 375°F (190°C). Combine flour, baking soda, baking powder, and salt in a medium sized bowl. Beat butter, sugar, and brown sugar until light and fluffy. Add eggs and vanilla extract. Continue to beat until combined. Stir in flour mix until dough comes together. Fold in milk chocolate morsels with caramel filling. Form rounded tablespoons of dough into balls. Place on prepared baking tray 2 inches apart and flatten balls of dough slightly. Sprinkle sea salt on top of each cookie dough. Bake in preheated oven for 12 minutes or until edges are golden brown. 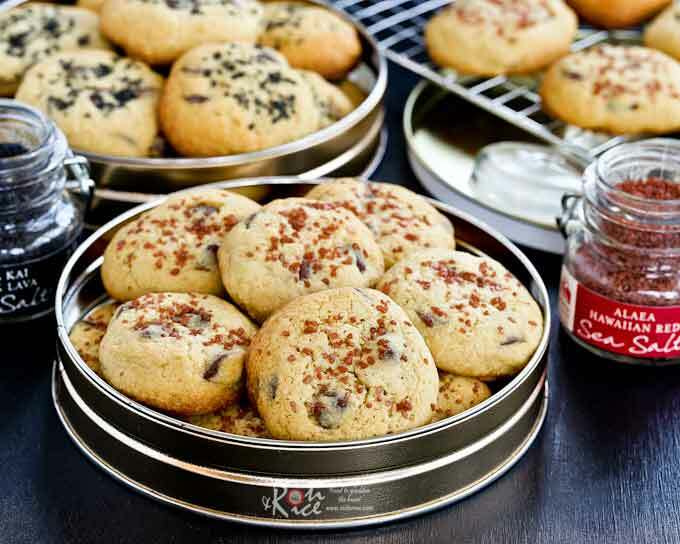 Remove and cool cookies on a wire rack. Transfer to air tight containers. ** 10 oz (283g) Sea Salt Caramel Chips will also work.